For the month of February, Teamotions and The Foundation for Living Beauty have united to share our love for women fighting cancer. This month, Teamotions has put together a limited edition Living Beauty Tea Bundle and will donate the net proceeds of the sales to The Foundation for Living Beauty. The Foundation for Living Beauty is dedicated to improving the quality of life for women living with cancer and cancer survivors. The foundation has been providing retreats, educational opportunities, sisterhood events, and resources to Living Beauties since 2005. Hundreds of women struggling with cancer and its aftermath find support and resources at The Foundation for Living Beauty, along with the understanding of many other women who have walked in their shoes. Teamotions has been helping women heal emotionally and physically one cup of tea at a time since 2011. Their delicious and award-winning tea blends contain powerful adaptogens - herbs that improve the bodies ability to respond to stress, boost immunity, and foster emotional well-being - transforming a cup of tea into a truly healing experience. "Teach a woman how to put her heart first and she will change the world." Scoop. Steep. Love Yourself. Repeat. 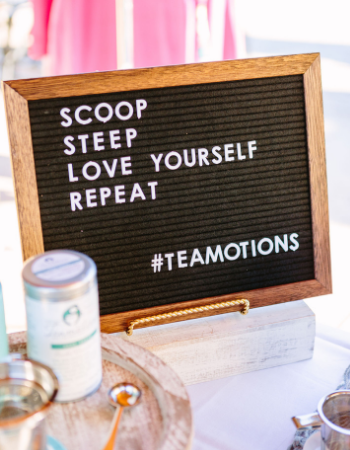 Teamotions blends are special wellness teas for emotional well-being. Each tea is a powerful self-care tool we created to have a unique emotional benefit to nourish your mind, body, and soul. These amazing properties come from including adaptogens and botanicals in each blend. Adaptogens are herbs that restore homeostasis to all systems of the body, improve the body's ability to cope with and respond to stress, boost immunity, and foster emotional well-being. They are safe, effective, and non-toxic. Creating each Teamotions blend was a deliberate process from our heart to yours. Every blend is well researched, every ingredient is purposeful, and every flavor combination is intentional so that every cup will cultivate mental, physical, and emotional wellness from start to finish. Each tea is blended to have an uplifting aroma, to look beautiful, to taste amazing, and most importantly, to be effective. organic flavorings. All of our ingredients are inspected by hand in an organic compliant facility, blended by hand in small batches, hand packed into tins, and hand labeled with love. We are proud to provide the finest product possible for your comfort and healing. Q: How can tea help heal spiritually and physically during a cancer journey? A: Cancer is a traumatic journey for so many reasons. Every cancer journey is different and many factors are simply not in control of the cancer patient. It can leave patients feeling helpless, frustrated, and overwhelmed. Facing cancer treatment can be more tolerable emotionally when patients empower themselves to be proactive with activities and choices they can control instead of only focusing on what they cannot control. Choosing a tea ritual carves out a time every single day to actually do something that comforts the body and soul. It creates space to check-in emotionally and nourishes the body with the adaptogen herbs Teamotions includes in every signature blend. Every cup of Teamotions tea is an outward expression of an inward commitment to essential self-care through every stage of a cancer journey and beyond. Q: What were some of the special aspects of the Healing Tea Ritual? A: Cultivating a Healing Tea Ritual with Teamotions teas offers two important benefits. The first benefit is the physiological effect of the adaptogen herbs - safe and effective herbs that restore balance, increase inner strength, and improve your body’s resistance to stress on a physical level. The second benefit is the effect habitual teatime has on brain neurology. A tea ritual helps your brain shift from Beta waves to Alpha waves. Beta waves help you make decisions needed for survival and short term needs but Alpha waves make it possible for you to comprehend more philosophical concepts like hope, dreams, goals, purpose, and intention. It is these kinds of concepts that help us persevere in the midst of hard seasons and motivate us to transcend merely surviving. Each cup of Teamotions tea becomes a powerful tool for healing. Q: What teas would you recommend in particular to help with inflammation? A; For inflammation, I’d recommend Have Hope. It’s a caffeine free peppermint tea with St. John’s Wort, holy basil, and oat straw. The oat straw in this blend especially helps with inflammation because it is high in minerals. Minerals help restore PH balance in the body and correct PH fights inflammation in the body. Q: What teas would you recommend for emotional/spiritual calm? A: For inner peace, I’d recommend Seek Peace, a coconut rooibos chai with liver support herbs dandelion root and milk thistle. The purpose of this tea is to help release pent up and stuffed down emotions by supporting the liver and improving circulation in the body to move stagnant feeling out and emotional peace in. By purchasing this limited edition Living Beauty Tea Bundle you will be supporting yourself and others physically and monetarily as Teamotions will donate 35% of the sale of this product to The Foundation For Living Beauty. For the month of February, Teamotions and The Foundation for Living Beauty have united to share our love for women fighting cancer. This month, Teamotions has put together a limited edition Living Beauty Tea Bundle and will donate 35% of the sales to The Foundation for Living Beauty. This bundle includes full-size tins of each Seek Peace, Have Hope, and Share Love. Ingredients and Their Uses: Rooibos*, Cardamom*, Ginger*, Cinnamon*, Cloves*, Dandelion Root*, Milk Thistle*, Coconut*, Black Pepper*, Pink Peppercorn*, Neem Leaf*, Natural Flavors. *Denotes organic ingredients. Possible allergens: Tree nut. With rose petals blended to open your heart, encourage connection, and deepen genuine love. Flavor Profile: Romantic floral undertones soften the rich earthiness of this tea. Emotional Benefit: Opens your heart to encourage connection and to deepen genuine love. Did You Know? : Rose petals are known for their ability to nourish the heart and lift the spirit. Our Little Tip: As you sip, share your heart with those you love. Let your words be an offering of care, connection, and appreciation. Ingredients: Dark tea, rose petals.